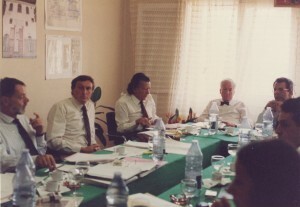 In relation to the UNESCO campaign for the safeguard of the historic city / medina of Fes and the possibility of entering into a World Bank loan arrangement for the conservation and development of the medina, a five-day meeting was organized in Fes in September 1988. This was done under the aegis of the Ministry of Interior in Rabat and its field office of Ader, Fes. International consultants / representatives from UNDP, OPS, UNESCO, World Bank, and Habitat attended the meeting, alongside Moroccan counterparts, the Municipality of Fes and the governor’s office. UNDP fielded the UNDP/UNESCO coordinator in Latin America and the Caribbean S. Mutal to participate in this meeting. After the brainstorm sessions a national UNDP project for the restoration and preservation of the city of Fez came in to being. The UNDP funded project executed by OPS New York was in turn subcontracted to three urban development agencies in France (Grup 8), Switzerland (Urbaplan) and Tunis (Sides). This project coordinated by S. Mutal eventually led to a World Bank loan arrangement with the goverment in Morocco executed through the early 2000s. All reports are in English and French.